BBC Studios and Andrew Kay & Associates are proud to announce Blue Planet II Live in Concert will tour to Sydney, Melbourne and Brisbane in March 2019 with UK superstar Joanna Lumley to host and live narrate this unique concert experience. Following the incredible success of the BAFTA award-winning BBC Studios Natural History series Blue Planet II, presented by Sir David Attenborough, Blue Planet II Live in Concert will bring the wonders and mysteries of the planet's oceans and its characterful inhabitants to the stage. Narrated live by the iconic Joanna Lumley in her first Australian stage appearance, and accompanied by the original immersive music score by Hans Zimmer, Jacob Shea and David Fleming, the concert will be performed live by the Sydney Symphony Orchestra, the Melbourne Symphony Orchestra and the Queensland Symphony Orchestra respectively. The concert features the breathtaking visuals from the television series, highlighting the incredible natural wonders of our blue planet in striking detail, projected on a state-of-the-art 75 square metre 4K Ultra HD LED screen. This will be the first time Joanna Lumley will appear on stage in Australia. Ms Lumley is one of the most recognisable and loved British personalities and a true national treasure. Starting her career as a model in the 60s, she is best known for her BAFTA-award winning role as Patsy on the hit comedy series Absolutely Fabulous and was recently honoured with a Rose D'Or Lifetime Achievement Award. Ms Lumley also hosts her own riveting travel documentaries that see her journey on the Trans-Siberian Railway, along the Silk Road and across Japan. Her 50-year career in entertainment has also seen her take on roles in the James Bond film On Her Majesty's Secret Service (1969) and Coronation Street. She went on to appear in The New Avengers in the role of Purdy in the 70s before landing the role of Patsy alongside Jennifer Saunders on Absolutely Fabulous in the 90s. Other credits include films James and the Giant Peach (1996), Ella Enchanted (2004), and The Wolf of Wall Street (2013). In addition, Lumley lent her voice to various projects, including Corpse Bride (2005). Joanna Lumley is also well known for her humanitarian and charity work across the world – especially in Nepal, India, Burma and Africa. She supports a number of charities that raise money to alleviate poverty and hunger amongst some of the world's poorest communities and is also a supporter of animal welfare. In 2013 she was named one of the 100 most powerful women in the UK. Joanna Lumley said: "I am thrilled to be coming to Australia for my stage debut hosting the breathtaking Blue Planet II Live in Concert. This incredible concert experience is not to be missed and I cannot wait to see you there"
Chantal Bindley, Head of Live Entertainment, BBC Studios, Australia and New Zealand said: "We are delighted to be bringing Blue Planet II Live in Concert to Australian audiences. With breathtaking footage from the ground-breaking series, an incredible music score and hosted by the one-and-only Joanna Lumley, fans are in for an unforgettable experience." Blue Planet II Live in Concert is a live adaptation of a television story that began some 20 years ago when a team of wildlife filmmakers from the BBC's Natural History Unit set out to make a television series on the world's oceans, the breadth and scale of which had never been seen before. Broadcast in 2001, the multi award-winning The Blue Planet, narrated by Sir David Attenborough, cemented the Unit's peerless reputation for underwater filming. 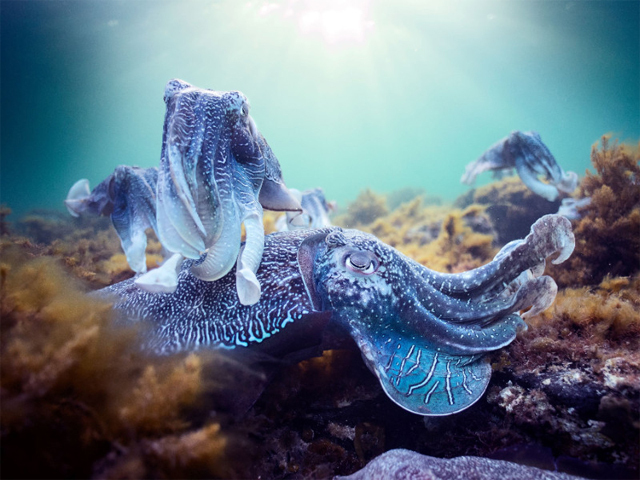 During the four years of filming for Blue Planet II, the teams embarked on 125 expeditions, travelled to 39 countries and filmed across every continent and ocean. They spent 6,000 hours deep-sea diving, 1,000 hours in submersibles, filming everywhere from our familiar shores to the deepest seas. Logistically, some of these expeditions could be compared to a trip into space – such was the effort. In the process, the camera teams encountered creatures that appeared so strange that they really did seem to come from a different planet. A fantastical journey from icy polar seas to pulsating coral reefs, from the luminous deep sea to enormous kelp forests: immerse yourself in Blue Planet II Live in Concert, an awe-inspiring and epic experience that you will never forget. Blue Planet II Live in Concert is proudly sponsored by Holland America Line. In 2017, BBC Earth and Holland America Line launched a fleetwide partnership which sees Holland America Line guests immersed in BBC Earth's award-winning, world-class captivating experiences via unique performances and programs. Together the BBC and Holland America Line are committed to bringing world-class experiences to guests and audiences around the globe.